Cataclysm: Dark Days Ahead is a free game. This means that the source code is available to be studied, modified, and distributed. Most projects look for help with testing, documentation, graphics, etc., as well. 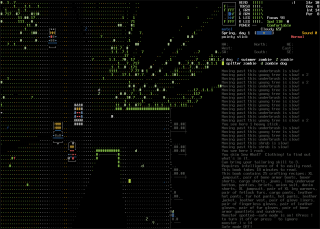 Cataclysm: Dark Days Ahead (sometimes abbreviated DDA) is an open-world roguelike survival simulation game. It is primarily coded in C++ and Lua. The game is licensed under the Creative Commons Attribution-ShareAlike version 3.0, though it uses two fonts that are licensed under Creative Commons Attribution 3.0 and GPL version 2 respectively. Cataclysm: Dark Days Ahead is an offshoot of the original Cataclysm by Zachary "Whales" Jenkins, which is no longer actively maintained. Dark Days Ahead's most recent stable release is 0.C "Cooper," which appeared in March of 2015, though the game sees daily commits to its "experimental" builds. Set in a near-future New England in the wake of a zombie apocalypse, Cataclysm: Dark Days Ahead puts the player in the role of a lone survivor who must gather resources, train skills, craft useful items, and fight monsters across the blasted, ruinous wasteland of the former United States. This nightmare world is populated not only by the undead, but also by monsters of many other stripes. It will take careful management, foresight, and no small degree of luck to survive the dark days ahead. At the beginning of the game, the player creates an overworld to play on by defining certain generation rules. After that, the player creates a character to control. There are many preset classes to choose from which will greatly influence your starting skills, equipment, location, and other factors. Additionally, the player can take a number of positive and/or negative traits and strengthen several useful skills that have various effects on playstyle. Next, the player generates their character and starts the game. The player navigates a large overworld while collecting items and fighting monsters. The player must constantly be on the lookout for food, water, shelter, and medical supplies to aid them in surviving the harsh conditions of the game. The player can gain experience in certain skills, either through practice or by reading specialized books. These skills may make the player better at combat, or give them new abilities, crafting talents, and more. There are many in-depth gameplay systems in Cataclysm, such as the ability to repair and drive cars, cybernetically enhance your own body, mutate yourself, and interact with NPCs. Also, there are countless different monsters to fight, ranging from typical movie zombies to demons, cyborgs, cyclopean horrors, and more. Cataclysm: Dark Days Ahead is a fork of Cataclysm, a zombie roguelike which ceased development when its original creator, Whales, moved on to other projects. When the first Cataclysm was abandoned, a small but dedicated portion of its playerbase continued to create mods and additional features for the game, thinking they would never be implemented in the main branch. However, at some point a web developer involved in the community set up a dedicated site for the game, and some other players jumped on the chance to fork the original game and resume active development, adding the subtitle "Dark Days Ahead." More recently, the community has moved to a discourse site. In June of 2013, a successful Kickstarter campaign was launched by the developers. Since then, Cataclysm: Dark Days Ahead has seen tremendous community growth and maintains a very active development schedule. Following are the major releases. Note that Cataclysm: Dark Days Ahead experiences near-constant development to its experimental builds, but these changes are only added to the main build when they are considered stable.